Even when penalties or fines are justified, there is a due process for hearings, appeals and payment alternatives. Working with a trained IRS defense professional who understands all the options, you can mount a sound defense strategy. Also included is a brief overview of liens and levies, and an explanation of innocent spouse rights. 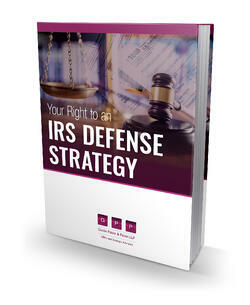 Please complete our form below to receive your e-book, so you can learn more about the IRS defense process.